Extravagance and luxury are words synonymous with Dubai’s booming property and business sector. It’s a city that continues to grow exponentially; growth typified by the continued expansion of Dubai International Airport, which was this year named the world’s busiest airport for international traffic, taking the crown from London Heathrow. In line with an increase in Middle Eastern travel and the demand for greater airline capacity, Dubai’s new Concourse 4/D will open to the travellers in the second quarter of 2015, complementing the existing three Concourses – A, B and C.
The fully airside structure, developed under a metal shell, accommodates17 aircraft stands, complete with contact gates and boarding lounges. The 64,460 square meter floor-space comprises three main floors, complete with dedicated departure and arrival levels, boarding lounges, concession space (retail/duty-free and food and beverages) and first class and business lounges. Dubai International Airport - situated in the Al Garhoud district 3 miles east of Dubai - is visually stunning. The glistening stone floors, polished metal and glass fixtures, and the impressive waterfall centerpiece are all part of the airport’s commitment to deliver only the highest quality experience for all of its visitors. 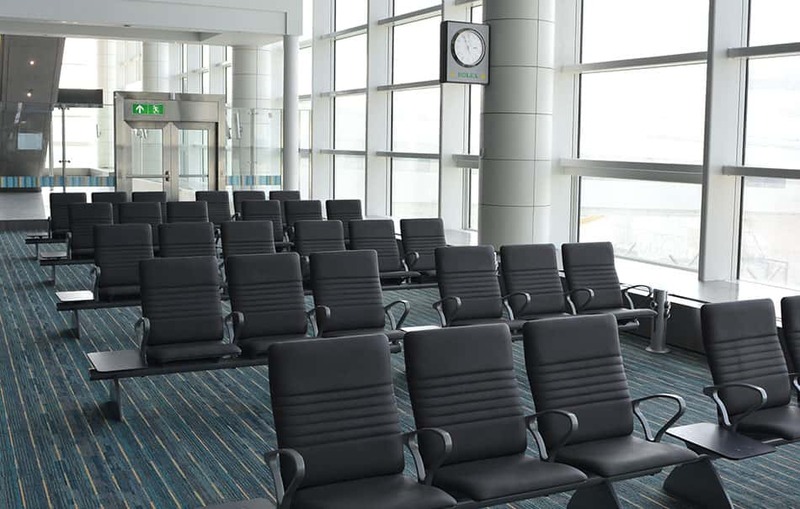 Maintaining excellence and luxury throughout was a central theme in the design and installation of the airport seating, too. 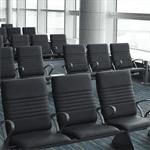 Zoeftig was chosen to supply 7000 seats for all concourse areas, with its superior Zenky Plus solution – a new premium product in the Zenky range – upholstered in a mix of blue, red, black and grey leathers, in both standard and recliner versions with footrests. Zoeftig also advised on the layout and beam configurations to enhance the flow, improve the traveller experience and to strike the balance between achieving maximum capacity whilst retaining a feeling of space and comfort. In most circumstances, where leather is the preferred fabric, Zoeftig fits its robust, hardwearing and high quality e-leather, which ensures that the marriage of quality and convenience is met. For Dubai, though, the drivers behind the design were very different and as such more sumptuous materials were required. The Dubai team was insistent that only the best natural materials, those that matched the class and elegance of the surroundings, would be appropriate. With this high-end brief in mind, a natural, soft hide leather was hand selected by Zoeftig’s in-house designers, complete with ribbing and hand stitched to produce one of the company’s most luxurious seating solutions to date. 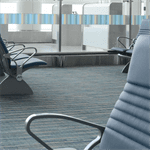 The finished product is a true match for the striking airport aesthetic. The rich choice of colours, use of finest leathers and the metallic silver armrests are a perfect complement to the opulent airport surroundings. 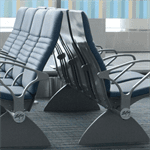 The inclusion of the reclining Zenky Plus was also a world first for the manufacturer. Zenky Plus has been installed for several large projects since its launch in mid 2014, however, the recliner version was not scheduled for production until 2015. Due to the level of interest from the Dubai design team and the demand for its installation in Concourse 4/D, Zoeftig fast-tracked its development. Zoeftig’s ability to match, if not better, the high levels of quality already set for the new concourse was a key factor in winning the contract. Another factor was location. The Dubai project is one of a rising number of installations that Zoeftig has won on the strength of its willingness to invest in new regions, rather than attempt to run all operations solely from one central office. Zoeftig’s new Dubai office (opened in January 2014 to cover the MENA region) was central to the successful delivery and execution of this latest project. The company’s commitment to widen its global reach and embed the brand in its key territories has been strengthened in the last few years with the opening of other satellite offices in Chicago, USA (serving USA, Canada and the Caribbean), Brazil (serving South America) and Asia (opening 2015). It’s this commitment to the territories that has shaped the company’s success on the global stage. A key driver behind Zoeftig being awarded this latest contract was its superb track record in the region. In 2009, the company won a major contract in the Middle East, to supply 2500 seats for the Dubai Metro. This was followed last year with another supply deal, this time for the Dubai Tram (opened early 2015) - the two landmark projects together are transforming the city’s transport infrastructure. Throughout the six-month process (from design to installation) for the Terminal 4/D project, meetings with designers and architects took place on an almost weekly basis, so Zoeftig’s proximity to the site enabled them to attend, offer guidance and help shape the designs from the outset. Without a regional office in the territory, headed up by staff who understand the local economy and business practices, the project would have been far less viable and the level of closeness and collaboration between all parties would have been difficult to achieve. The collaboration between designers, architects and specifiers is at the root of the success of the Dubai installation, and this model is delivering success in equal measure in many of Zoeftig’s other global installations, too. The Dubai team placed substantial demand on all of its suppliers in order to meet the extremely high standards set. It is Zoeftig’s ability to meet the bespoke requirements and hit the tight timescales set that’s a hallmark of its service and excellence, and one of many reasons why the company continues to stand above its rivals in the marketplace.